Cake Momma: My daughter's Super Mario Birthday Party! My daughter's Super Mario Birthday Party! My daughter is all about her video games these days - she is so good at them that when she plays with her dad she tells him where to find secret passages etc!! LOL!! And my husband is a gamer too - so you can imagine how funny I find this :) It's cute though - they have their "thing" and enjoy playing together. When it comes to the birthday party though? That is all mommy! 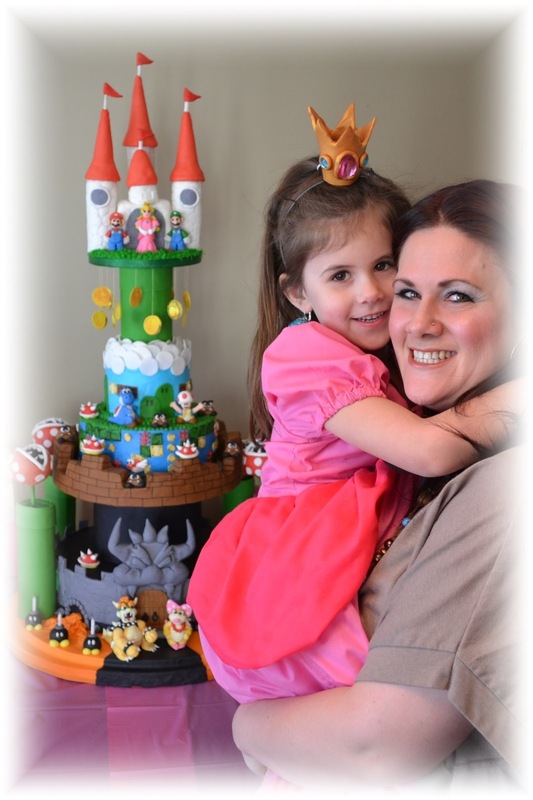 This year she wanted to have a Super Mario birthday bash! So I spent a good amount of time on my favourite site - Pinterest! What a place to go to when you need ideas for ANYTHING!!! I love it! I had so many wonderful ideas from that site and even came up with a few all by myself! Being the Cake Momma - the cake was pretty important for this event, so I sat down with my daughter to find out what she wanted this year. 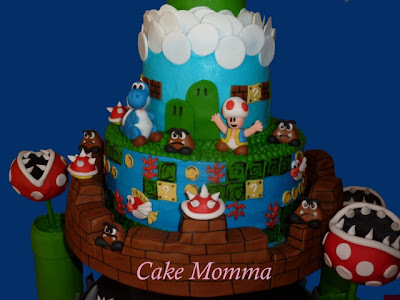 I have learned from other children that when you surprise them with a cake and "think" that you have included all of the important elements in the cake based on the theme that you were given, sometimes you can really miss something that was important! Kids are so honest! LOL!! So I sat my daughter down and asked her what she wanted her cake to include. 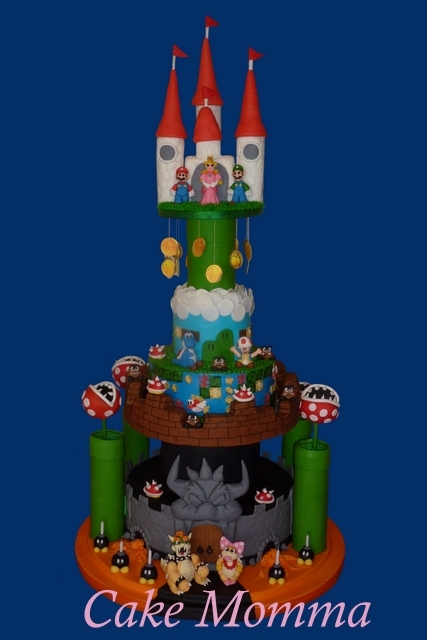 She said she wanted to have :Princess Peach, Super Mario, Luigi, Toad, Blue Yoshi, Bowser, The girl Koopa, Goombas, the castle and the "Bee-Bop-Po-Doodles" - that is what she calls those piranha flowers! Is that all? LOL! 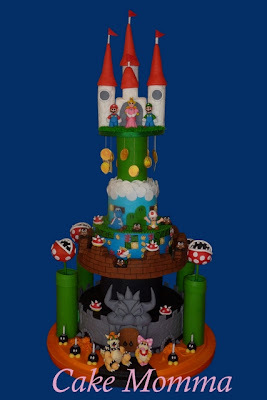 I like to think that I nailed it and even brought in some other fun elements that I thought would enhance the overall cake! There were so many elements to this cake - it was hard to get everything into one picture AND show the detail that went into everything! So I took a few photos of my creation! This part of the cake was all Styrofoam! What can I say? 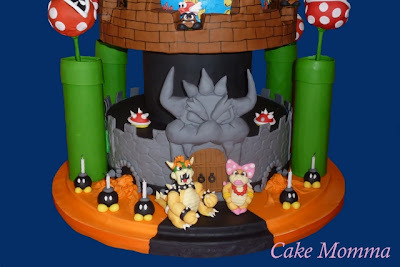 I like to go big with my cakes, but when you make cakes all the time? 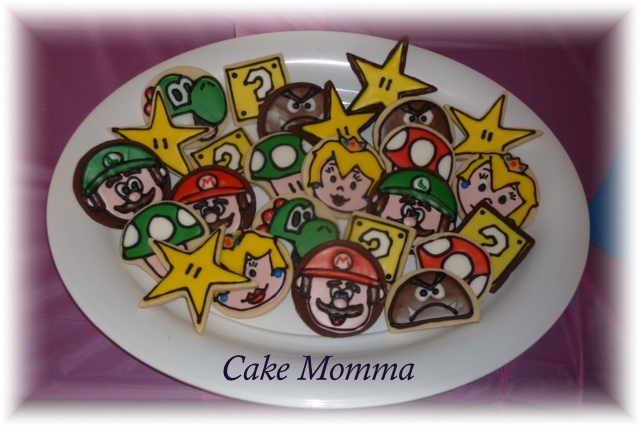 You do not want to eat them! LOL!! 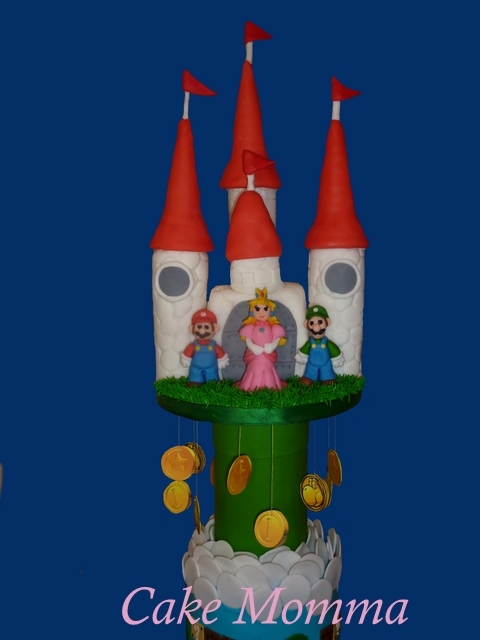 So I was able to make this portion ahead of time and just add the details when I put the real cake together! I love the candles! THIS is the actual cake that everyone enjoyed! And the kids all put in requests to eat the fondant characters as well as the Rice Krispie flowers! The center of this castle is made from Rice Krispies and the peaks of the towers are ice cream cones, but aside from the fondant characters everything else on this upper piece of the cake is not edible. Overall I am VERY proud of myself and this creation! I put a lot of work into it and it was so worth it! My daughter was in love with her cake and was telling me all week that I am the best mommy in the world! That makes it all worth it! 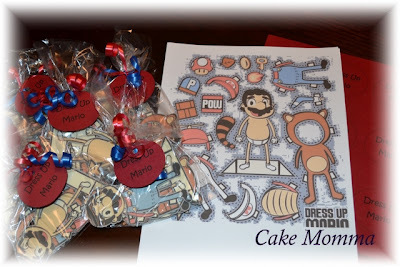 The cake aside, I made MANY other fun goodies for this party! I actually made Super Why cookies like this for my son's last birthday party - but did I take a photo of them? Nope :( Oh well, I was sure to take MANY photo's at this party so that I could remember all the hard work I put into making this day special for my girl! I got the sugar cookie recipe from http://www.lilaloa.com/p/recipes.html and they were amazing! I had to hide them from myself! Those chocolate cookies? They are pure evil! SO delicious!!! 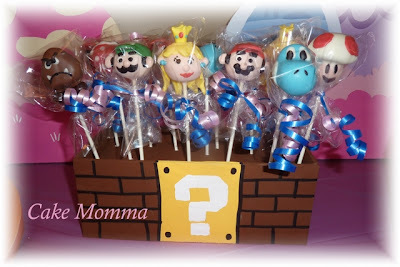 Who doesn't love a good cake pop? EVERYONE loves cake pops it seems! Unfortunately I won't make them for anyone other then my little ones anymore - they take way too long to make and while they are adorable, I just don't have the patience for them anymore! I figure if I only make them a few times a year for my kids functions, that is more then enough for me! I do enjoy finding fun ways to display them though! In this case I went with foam core from the good old dollar store! 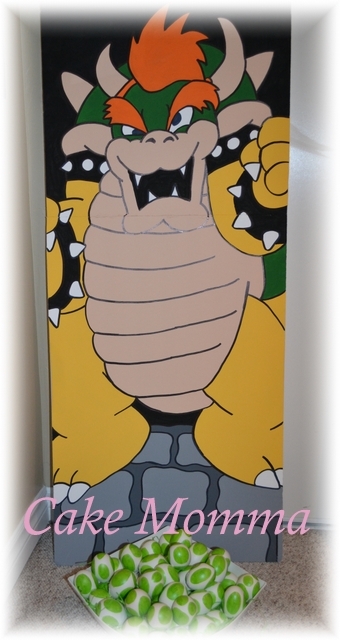 Take your hot glue gun and glue the foam core strips to your Styrofoam, paint and it's all done! Cheap to put together and the presentation is perfect! It is amazing the things you can do with foam core! 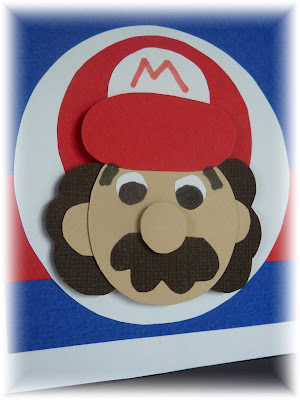 I printed out these photos of some Super Mario characters I found on line at Costco, glued them to my $1 foam core and used an exacto knife to cut them out! Then take your scrap pieces of foam core and create a support at the back - attach using hot glue! Simple, cheap and easy for your table decorations! I found this design on google and loved it! It was time consuming to make, but so much fun when it was all done! 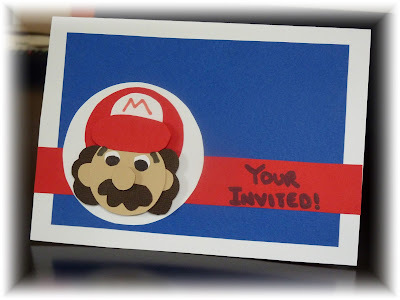 I just cut out all the pieces of the Mario man (yes I know he has a mullet) and then attached them to the card using small foam sticker squares that I found at the $1 store! And now my Mario (mullet) man is 3D! I don't know about you but at my last party I had about 10-15 bottles of water that only had 2-3 sips taken from them! What a waste!! 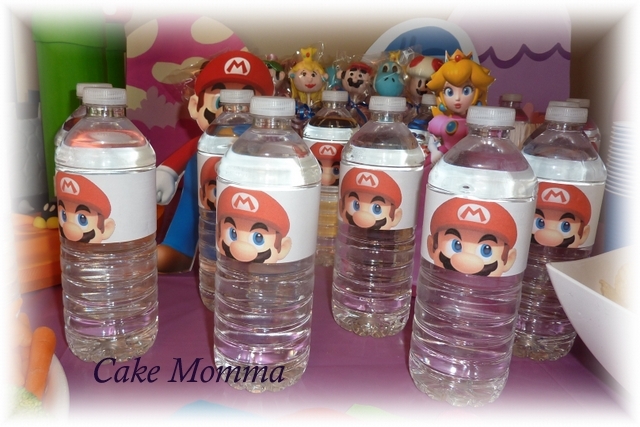 So as a solution I printed out these images on paper and cut them into strips that I taped onto the water bottles! I left out a cup of washable markers (I do not trust the kids with anything else at this age) and everyone wrote their names on the waters! A lot less waste this year! I did the same thing for the little ones! I remember the last party I went to - two boys fighting and crying because "He is drinking my drink!!!!! Ahhhhhhhhhhhhh!!!" LOL!!! 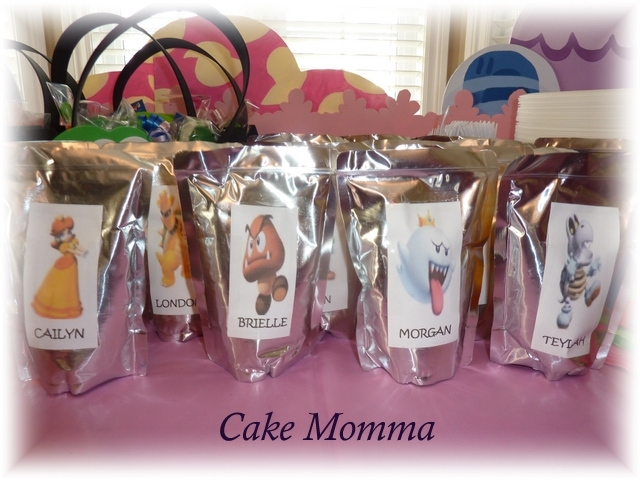 So I decided to not only put their names on the drinks - but also a different image for each child! This way the children who cannot yet identify their own name could still recognize which drink was theirs! Worked like a charm! My baby's!! 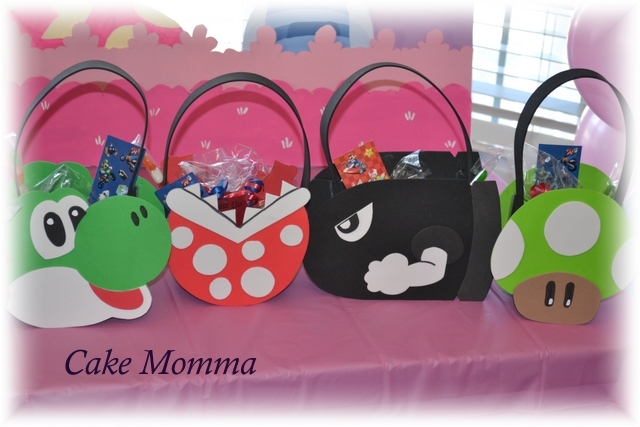 I love making fun goody bags for my kids party's! I made princess tutu bags for my daughters princess party last year, tool box's for my son's birthday party and now I have discovered foam!! You can make anything from foam! LOVE FOAM!!! 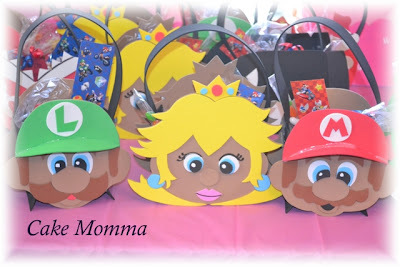 I will be using this for all of my kids party bags from now on (unless I find something else that is really cool! LOL!) I drew out all the characters that I wanted to make into bags and attached all of the pieces with hot glue! The kids were asking for their goody bags about 10 minutes after they arrived!!! Awesome! 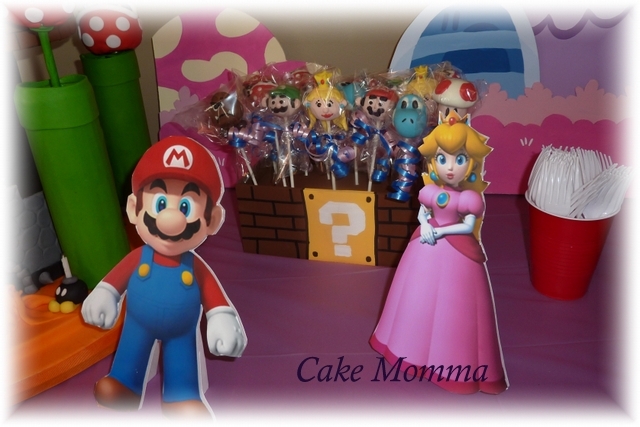 And inside each bag were Mario stickers, a cake pop, a special Mario cookie, Mario candy (you can find tons of this at the dollar store), gold coins (found at both the dollar store and the bulk barn) and also a fun bag of "dress up Mario"! I decided that I should have games this year as the kids are starting the get older! Good old Pinterest to the rescue! The Yoshi egg smash game? Amazing! I even found a video on how one lady made her eggs! So helpful! Bowser I painted on two sheets of Dollar store foam core - and the kids were amazed that I let them throw eggs with the intent to break them! LOL! One mom looked horrified when I started to put a plastic sheet out under the game! "Oh my god, are those raw eggs you are going to let them throw?!" LOL!! Ummmmm, no, not so much ;) This game was a HUGE hit!!! We also played pin the mustache on Mario ;) Simple, but lots of fun for the kids! 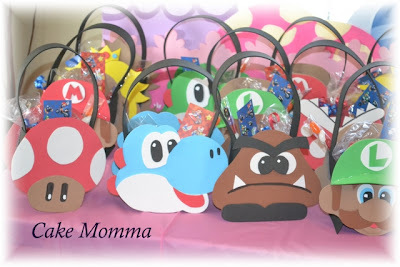 I was at the library for Halloween last year and this was one of the crafts that they had for the kids! How great! 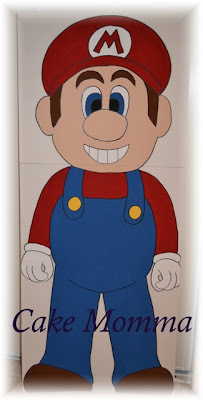 Print out some faces of your characters (isn't google great) - cut them out as well as the eyes, attach two strips cut from Bristol board and let the kids colour them! 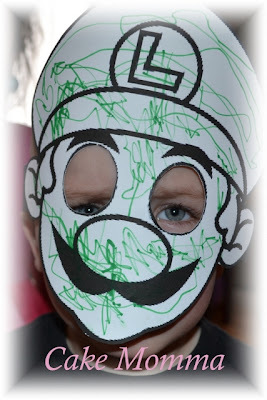 Then staple the masks together and the kids can pretend to be someone else! 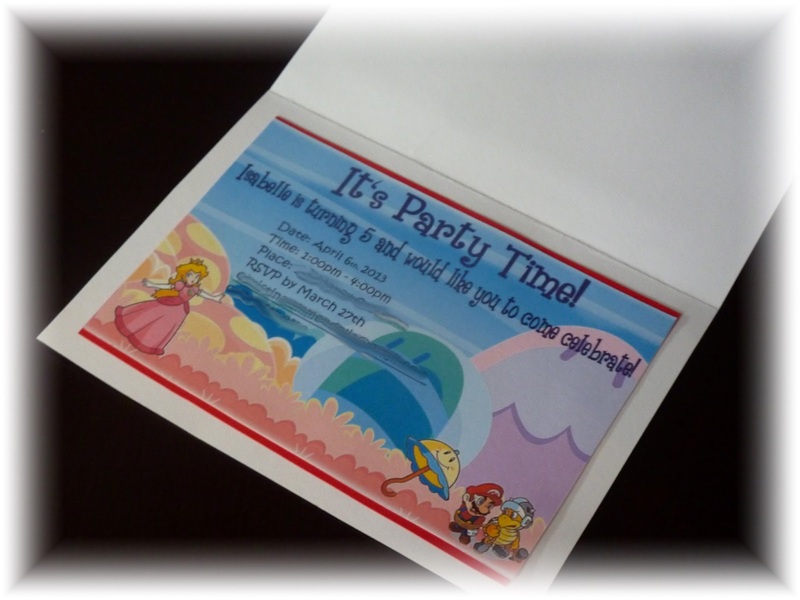 It was a great party and everyone had a good time! Both kids and adults! LOL!! Thank you to everyone who came - it wouldn't have been a party without you! Thank you Nita! My daughter was in love with everything and actually started to plan next years birthday party as soon as the last person left! LOL!! I've created a monster! lol!! No, I am so happy that my kids love their parties! Wait till you see the one in November for my son! Candy Land!! It's going to be so much fun, I can't wait!